RICHMOND | A group of conservative former Episcopal churches tangled with the Episcopal Church and its Diocese of Virginia before the Virginia Supreme Court on Tuesday over a unique state law that awards property to congregations that bolt their parent denomination. The 90-minute session before a packed courtroom of 140 onlookers, plus more outside, appealed a Fairfax Circuit Court verdict that awarded about $30 million worth of historic property to the 11 churches that broke away from the diocese three years ago. Five justices — three others had recused themselves from the case — grilled lawyers about the meaning and constitutionality of the state's division statute. The 1867 law allowed congregations — many of which had differed with their denominations over slavery — to leave with their property. The justices at one point reduced the lead lawyer for the denomination to a stammer and made her opponent waste valuable minutes explaining the nature of the 77-million-member Anglican Communion, the parent body of the Episcopal Church. The first lawyer, Heather Anderson, representing the Episcopal Church, was in the midst of explaining that the division statute did not apply to the 11 churches because the denomination had not experienced a "division" over the 2003 consecration of an openly gay Episcopal bishop: V. Gene Robinson of New Hampshire. A second gay bishop, Mary Glasspool of Baltimore, will be consecrated May 15 in the Diocese of Los Angeles. Instead, she said, the churches who left were merely a mission of the Anglican Church of Nigeria, which had set up a Convocation of Anglican Churches in North America (CANA) to shelter them. One of the justices pointed out that the Archbishop of Canterbury Rowan Williams and former Virginia Bishop Peter Lee had discussed CANA's existence at length, meaning that CANA had some stature in worldwide Anglicanism. Ms. Anderson dismissed this as "like-minded church leaders coming together for consultation." "Are they a branch then?" the justice asked. When Ms. Anderson dodged the question, Chief Justice Leroy R. Hassell Sr. demanded she respond. "I don't have an answer," she said. You're using "reports" ironically, right? I dunno about that Anon, there are many facts with no editorial, maybe you are displeased by the editorial choice of what quotes to include or exclude, but as to the reporting on what happened, I think this is a good article by journalistic standards. If you are looking for an editorial, with minimal detail of events, I'm sure the Falls Church News Press will not disappoint you, if they bothered to drive down I-95. Relying on the Moonie Times? Good source there! Better source than you've turned out to be, you've added nothing to consider but ad hominem comments, doing so without even a name ... so for all I know you're seven year old in a computer in Wisconsin, who never even heard of an Episcopalian. The "Moonie Times" doesn't have a dog in this fight - more reason for them to be objective and unbiased. So much for that other cheek and loving those who persecute you. Sigh. Besides, being Kevin, an Accountant in Virginia really lets us know who you really are. Sorry, that is what it says in your user profile. Is that not accurate? Billing out invoices, thus AR, but not an Accountant ... you would have put me a few certificates ahead and hopefully paid a lot more money using that term. Moonies may not have a canine in the fracas, but Julia Duin attends the Falls Church CANA. She's blogged about it. That she has no quotes from the other side reduces her to an opinion blogger (the WT being reduced to online only). I was there, and she has some facts wrong. Heather Anderson said she said it was a closer question whether CANA was a branch if they hadn't joined the Church of Nigeria but had been a stand-alone. When pressed on whether it was a branch in that hypothetical she said, finally, "I don't know.". She never said that she "didn't know" whether CANA is a branch. Without equivocating, she said it wasn't. Johnson stated that it was a branch for purposes of the Division Statute only, but in no other way. I have a question for all of you who live in Virginia. If TEC loses here, how many other parishes in the Diocese of Virginia will consider leaving TEC? I am not the 4:48 Anonymous. I was there. Julia Duin's hatchet job has several facts wrong, not just what the prior Anonymous points to. And frankly, this is not the first absurdly bad and biased article she's written on these cases. It is possible to cover these cases in an accurate and even-handed way. She doesn't. Our dear blog host has twice deleted comments in which I pointed out BB's errors, so I don't plan to attempt to say anything about Julia Duin's. Judging by the disgruntled "anonymous" posts here, I'm guessing this was a good day for the good guys (Orthodox, that is). Actually, it quite evidently was not a good day for the "orthodox." Prepare for several years more. "Actually, it quite evidently was not a good day for the "orthodox." Prepare for several years more." Twirling your little mustache there, Snidely Whiplash? By the way, I believe Julia Duin has publicly stated that she is not a member of The Falls Church. I also just checked my TFC directory and she is not in there. There has been much criticism on this article and how it is either "hatchet job" or can't be trusted, but NO new information. You all must really be upset by what is reported. 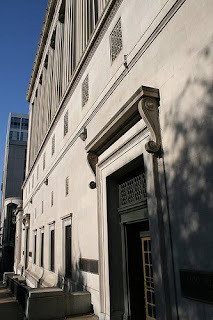 If you were in the courtroom and have something to say that you feel the author has left out, generally, if you want to be creditable, even as a Anon, you should say something like, "what has not been reported is when a justice as X, council Y answered Z" or something that contributes to the general pool of data for those of us who were not there, else you are merely proving that you really don't have anything to say for the rest of us, but merely venting emotion. Kevin, I think Anon 4:48 did, in fact, add new information. From my TEC friends who were in the room, I'm hearing that they think they have a chance. BB, in your gut, what do you think? Duin may not be a "member" but she's been on parish retreats and discussed going to the FC cana. Anon earlier is right about that. Oh yeah, it was a gladiator fight. The only one who seemed to get out without bruising was the solicitor general - because of that, I think the case that the statute will be found unconstitutional is slim. It was also very helpful that the solicitor general also spoke in favor of the Virginia churches position over TEC's. That being said, the TEC attorneys were fierce and prepared. It was a major blunder though when TEC maintained that the VA legislature did not have authority over the TEC canons - canons trump commonwealth law. The justices asked why the diocese did not conform the the deeds of the churches to commonwealth law if the diocese felt it owned everything (and the revolt at Christ Church Alexandra when they thought they were going to be compelled to transfer their deeds to the bishop illustrates that the Diocese of Virginia is not top/down authority, but more of blend - including, unlike most dioceses, lacking the power to impose assessments on the parishes. It seems that there it would be, as Judge Bellows wrote, "Blinking at reality" to say there has been no division. The court room itself was an illustration of the deep division in The Episcopal Church - and the fact remains, most of us laity are still registered Episcopalians, we have not been reaffirmed Anglicans, but remain Episcopalian in that the Episcopal books do not show us as no longer being Episcopalian. I know I am still an Episcopalian, but I am separated from TEC. I've gone down a branch from TEC into CANA. A branch is like a river, and we all got on life boats and said down that branch of the river to CANA and finally, God willing, we sail straight into the river called ACNA. It began in TEC, branched off into CANA, and now to ACNA, a province in formation within the structure of the Anglican Communion (and yes, there is a structure). The denomination we all belong to is Episcopalian/Anglican in communion with the Archbishop of Canterbury - who at Lambeth stated that he believed the Anglican Communion was the church. TEC, but the Church of Nigeria branched off as well and together these two branches formed CANA. In my opinion, the justices did seem confused about what constitutes a branch and so we will have to wait and see how thoroughly the will read their briefs and look at the evidence. My prayer is that they will take this very seriously and in doing so, seriously ponder what is the right thing to do. Perhaps one of the reasons the court is struggling with the terminology of the statute is that the statute is confusing. It was put together to cover a particular situation nearly a century and a half ago in the inimitable style of Virginia legislation - a member represented a church that had a problem with Yankees and he wanted a fix. It worked for him (and a few other churches that he represented in his private law practice) at the time, but probably doesn't travel well. No way the legislature, even ours, would pass something like that today. The secession of the Virginia parishes was planned by lawyers for months, perhaps years, to fit the statute. If they couldn't make it work, it's not for lack of effort. I think TEC's best argument, marginally, is the constitutional one, just because it an area less clear, where anything can happen. If TEC is hoping to overturn the lower court's application of the statute, that is a long shot. That and 3 bucks will get you a cup of coffee at Starbucks. Scout, I'm not certain where the idea has arisen that the departing church lawyers cultivated this stuff for years to fit with the division statute. From what John Yates has said, the lawyers didn't even know about the division statute until they spoke with a church history expert. That was after the split occurred. Yes, but the ABC didn't. Disruptive, precipitous, lawyer-driven actions (they didn't know? Pshaw), destructive and presumptuous actions were met with the correct response. To be Anglican is not to do what CANA did. Frankly, it just wasn't cricket, what, what! BB, Your argument is silly! I'm still on the books as an Episcopalian even thought I left 14 years ago because they never take anyone off the books! You don't have to be reaffirmed as Anglican to be Anglican if you were Episcopalian. That's just silly! Especially in light of the fact that you say you were reaffirmed by the ABC in 2004. Did he think that somehow he was saying that you are Episcopalian (which he is not) or a part of the Anglican Communion? Is that why you have been saying all these years that you are still Episcopalian? Because your name is still on their books? Well, honey, then no matter what you believe, or what the Episcopalians believe, you will always be one of them, because they don't let you go! Once Episcopalian, always Episcopalian! I do not understand why you have such an aversion to being called Anglican! No, departed congregations are not on the Episcopal books. Check with the Diocese. They list the churches as abandoned, which was the only canonical way to deal with it. None of those congregations have the right to vote at Convention and all of the clergy have been defrocked. You are no more an Episcopalian than the Methodists under the Wesley boys were. You call yourselves "Anglican" but the ABC doesn't recognize you - the sine qua non of being Anglican. You're bootstrap Anglicans - and there is nothing wrong with that! But bb, you're just no longer an Episcopalian - ask someone at the Bishop s office. Jeff - I got my views on the subject after hearing it discussed extensively at congregational and informal meetings and discussion at TFC in the months before the vote. It was front and center at least as early as the summer of 2006 and was offered as the reason people could vote to leave without fear of losing the property. To be fair, it was never stated to be bullet-proof, there were always caveats that "our chances of keeping the property are better than 50-50 . . . etc., but people were assure that their vote on secession was not likely, in Virginia, to cause them any inconvenience in terms of having to find a new place of worship. My own opinion is that this argument swayed a great many votes, especially among people who were ambivalent or just didn't care greatly about the sexuality issue, but who were keen on continuing to worship in a church that had been their home for many years. John Yates was present during some of these discussions, so it surprises me that he stumbled on the notion only after the split. The departing group at TFC moved quite quickly under the statute to go to court to claim title under the statute, so I think it unlikely that that course of action was a result of a post-vote discovery. A - The ABC has no authority to declare "TEC's actions as a church-dividing heresy, throwing them out, and recognising ACNA/CANA as the replacement province". B - If you actually suppose for one instant that a US court would strip an American church of its property and award it to another denomination on the say-so of the primate of George III's established church, you might be smoking something pretty strange. Scout - This account surprises me, as I attended many of those parish meetings and did not hear about the division statute. The argument given before separation was usually something to the effect of "The Falls Church predates the diocese, so we may have a unique argument for ownership of the building". I'll note that this is the same argument that Christ Church Savannah used, unsuccessfully, in their initial court case. Please note that I am not challenging your account, just saying that it is not what I experienced. Similarly, my experience did not reveal ambivalence in the parish. People in large numbers had been clamoring for departure from the diocese since 2003. I seem to recall that BB herself argued early on in this blog that parishes such as Truro predated the formation of TEC as a church separate from the Church of England, and that that was the basis of the parishes "right" to leave TEC and hold on to the property. Looks like I will be spending my weekend looking back through old blog postings. I think the "predates TEC" argument is only potentially relevant if the statute doesn't apply. I'm not saying it's dispositive--but it doesn't even come up if the statute is applicable. I was not in the center of the leadership of the departing parishes, so I don't pretend to know precisely what the evolution of the legal strategy was. I only can state that at TFC, I, as a moderately interested parishioner, was aware that Virginia law was peculiar and was cited as a reason that, despite contrary precedent in other states, those who left thought they could hang on to the chattels and real property. Again, the alacrity with which all the departing parishes went to court to assert title leads me to believe they didn't tumble to the Division statute after the vote. Not sure that it's an important point in any event at this time. I was responding to Jeff Walton's query about where the notion came from that there had been a pre-existing design to work the circumstances of departure into the wording of the statute. As to the ambivalence issue - who knows. I think those who tended to be most avid about schism tended to be more vocal and more likely to attend meetings than those who had reservations. the clergy and vestry were hard over for departure for quite some time and organized all the process leading up to it. A lot happened within the counsels of those two groups and the congregation was brought along very carefully. My opposition only became fully formed very late in the process after I realized the departers (with whom I had not theological disagreement) intended to try to take over the property, a measure that I felt to be morally and ethically unconscionable on several levels. Several hundred people either voted no or did not vote. some of those may just have not been able to get out of bed that morning, or there may have been other motivations, but that is a significant number even against the pre-vote trimmed down election rolls. Scout - when you talk of "schism", do you mean "TEC" walking apart from the AC, rejectin the repeated pleas of the ABC and the AC Primates? You cannot mean those Anglicans who are in line with most of the AC - they are not guilty of schism....they are in line with most of the AC, after all. From the author of the article: Would whoever is posting as 'anonymous' have the guts to leave their names? Re their concerns as to where I attend church, TFC is a lovely place but I have not lived in Virginia for going on two years now. So no, I do not attend there but I *do* attend in the Diocese of Washington. Does that satisfy you?